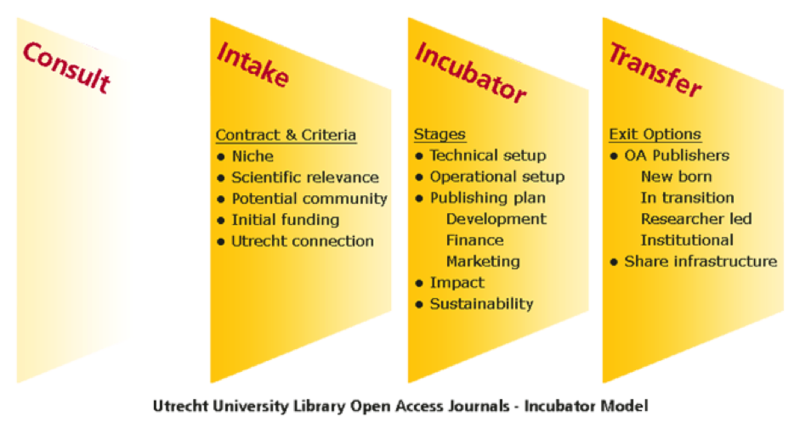 Uopen Journals uses the so-called ‘incubator model’. This model aims to help academic journals to become high-quality, peer-reviewed periodicals in six years. At the end of this period a journal will ideally have a sustainable financial model and maximum impact in its subject area and be ready for self-publishing or for a transfer to the (commercial) open access market. Uopen Journals is a service provider. Ownership remains with the journal at all times. An important step in the incubator model is to create a publishing roadmap. This map will act as a framework for the period of development within the library. The library’s publishing consultant and the journal’s editorial board will also draw up financial plans in line with the foreseen growth of the journal (e.g. by gradually introducing Article Processing Charges (APCs)) and sketch a possible transfer scenario. Together they outline goals in terms of usage, reach and impact that would make such a transfer feasible. The library’s publishing team collaborates with the boards of each journal in many ways, in order to ensure that these goals are reached. The editorial coordinator, for example, works on the quality of procedures and policies and on services for authors, reviewers and readers in order to manage and increase transparency and the quality of the journal. This helps establishing the journal’s reputation in an open access environment. The online marketer makes sure the journal is indexed in relevant databases and uses Google Analytics and Article Level Metrics to increase readership and discoverability. The marketer can also advise on content strategies and community building. In this way, the incubator model allows and encourages each journal to take small steps and to gradually develop strategies towards becoming a sustainable (and established) open access journal.